Performed a preliminary damage assessment on 41 buildings to determine the structural integrity and to determine if the buildings were safe for entry. Working through the night and weekend, we were able to complete the surveys, and a preliminary report of findings was delivered only 6 days from the initial start of the project. Wind damage caused in excess of $40M in structural damage to the high-profile racing facility. 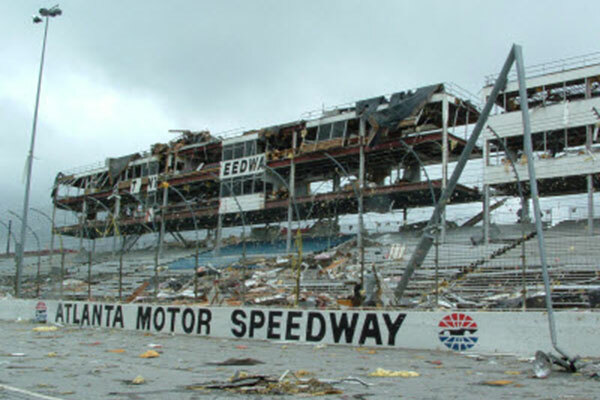 Read the article published in Structural Engineer about the condition assessments and forensic work done by IEI to help AMS rebuild quickly or download a PDF of the article: Atlanta Motor Speedway - Assessing the Damage.